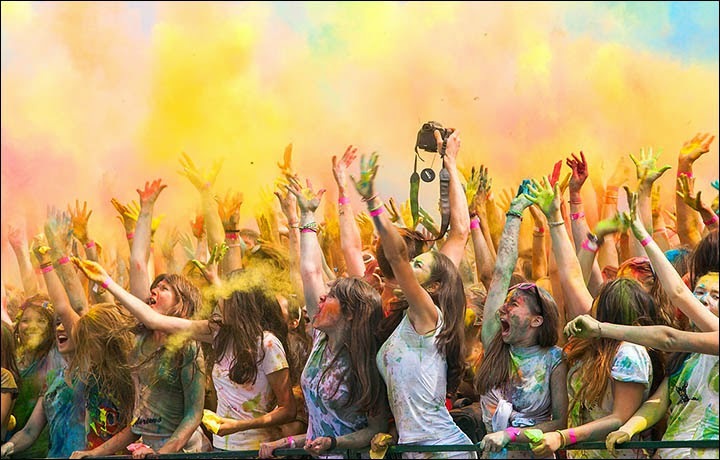 Participants daubed each other with paint and coloured water in a mass frolic of colour. They also hosed each other and jumped into the vats with coloured water. There were performances of acrobats and jugglers and all visitors could make a mehendi, a temporary henna tattoo. Organiser Anatoly Koptev said: 'The idea of the festival was met with such a great response that we ended up welcoming a lot more people than we expected; at some point we ran out of paint and had to bring an extra truckload in. That's a great set of photos, suddenly makes the world seem a happier place. I always learning something when I'm here, so thanks for all your posts. Greetings, phil, and thanks for the comment.